Enquire or book a trip along Bến Tre - Cái Bè - Cần Thơ - Vĩnh Long. 06:30 Departure towards Vinh Long. The passengers take their breakfast while enjoying the scenery on the banks. 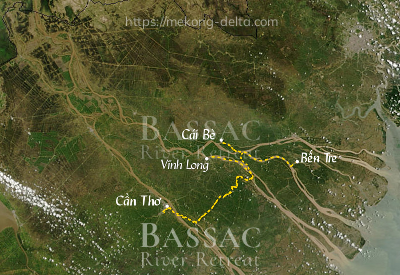 Upon arrival at Vinh Long, check-out and transfer onto a local boat for a visit of the gardens and orchards of Binh Hoa Phuoc, then final disembarkment. End of services by mid-morning on shore at Vĩnh Long. If you are staying near Bến Tre, you may have a good time at The Island Lodge, at Michel and Françoise's on Thới Sơn island, facing the Mekong. The Island Lodge offers a relaxing experience by the pool, a view over the lush and ever-varied green of the countryside, and gourmet dining at Le Comptoir de Marthe et Édouard.